Cooper moved from the Queensland Reds. 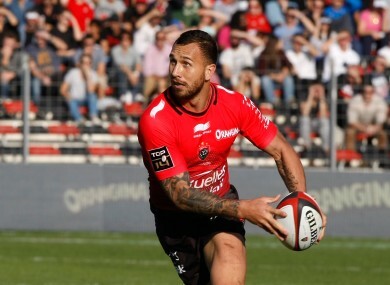 QUADE COOPER TURNED on the style on his Toulon debut as Josua Tuisova scored a hat-trick as Montpellier suffered a 52-8 Top 14 hammering on Saturday. The impressive form of fly-half Bernard Foley ensured Cooper was a spectator for much of Australia’s run to the Rugby World Cup final, but he made an instant impact for Toulon at Stade Mayol. Cooper produced a clever grubber kick to set up one of two quick-fire scores for compatriot Lachie Turner as rampant Toulon ran in eight tries to take their Top 14 record this season to four wins and as many defeats. Montpellier did not do themselves any favours, with Bees Roux and Ben Mowen yellow carded before Samu Manoa put the European champions in front with his first try for the club. Cooper’s poor pass enabled Julien Malzieu to score Montpellier’s only try just before half-time as the visitors reduced the deficit to 19-8 at the break, but Toulon shifted through the gears to pull away after the break. The impressive Cooper was heavily involved as Montpellier were dispatched, with Tuisova scoring all three of his tries in the space of 16 minutes and Steffon Armitage going over again after claiming a hat-trick last weekend, before Sebastien Tillous-Borde scored try number eight. The reigning three-time European champions went into the weekend on the back of four defeats in their opening seven games. Email “Quade Cooper pulled on a Toulon jersey for the first time today and stole the show ”. Feedback on “Quade Cooper pulled on a Toulon jersey for the first time today and stole the show ”.